Bangkok is known for historic sites, shopping, nightlife, spas, and museums. 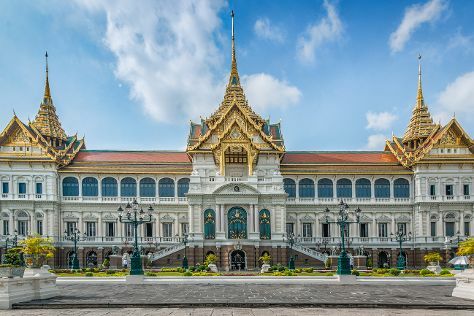 Your plan includes some of its best attractions: step into the grandiose world of The Grand Palace, delve into the distant past at Wat Pho, examine the collection at Jim Thompson House, and identify plant and animal life at SEA LIFE Bangkok Ocean World. For ratings, photos, reviews, and other tourist information, use the Bangkok trip itinerary maker site . Chicago, USA to Bangkok is an approximately 23-hour flight. You can also do a combination of flight and bus. You'll lose 13 hours traveling from Chicago to Bangkok due to the time zone difference. Traveling from Chicago in April, things will get much warmer in Bangkok: highs are around 96°F and lows about 80°F. Wrap up your sightseeing on the 13th (Sat) early enough to travel to Patong. You've now added Karon Beach to your itinerary. Kick off your visit on the 14th (Sun): tour the pleasant surroundings at Karon Beach, browse the different shops at Ocean Plaza Patong, then don't miss a visit to Bangla Road, and finally discover the deep blue sea with a scuba or snorkeling tour. Get ready for a full day of sightseeing on the 15th (Mon): whizz through the canopy at some of the top local zipline courses and adventure parks, relax and rejuvenate at some of the best spas, then get your game on at Game Space Laser Battle, and finally browse the different shops at Jungceylon. To see where to stay, maps, traveler tips, and more tourist information, you can read our Patong trip planner . You can do a combination of flight and bus from Bangkok to Patong in 5 hours. Other options are to drive; or do a combination of train and bus. In April, Patong is slightly colder than Bangkok - with highs of 91°F and lows of 75°F. Finish your sightseeing early on the 15th (Mon) to allow enough time to travel to Chiang Mai. Start off your visit on the 16th (Tue): contemplate in the serene atmosphere at Wat Phra Singh, then delve into the distant past at Wat Chedi Luang Worawihan, and then take in the spiritual surroundings of Pikanesuan Devalai Chiangmai. To find other places to visit, traveler tips, where to stay, and tourist information, refer to the Chiang Mai online itinerary planner . Traveling by combination of bus and flight from Patong to Chiang Mai takes 5.5 hours. Alternatively, you can drive; or do a combination of bus and train. Traveling from Patong in April, expect nights in Chiang Mai to be about the same, around 75°F, while days are a bit warmer, around 99°F. Wrap up your sightseeing by early afternoon on the 16th (Tue) to allow time for travel back home.